Welcome to New Zealand's acclaimed adventure capital. Snuggled into the shoreline of Lake Wakatipu and towered over by vast mountain peaks, Queenstown is completely devoted to tourism and offers up a ridiculous amount of ways for travelers to get their adrenaline thrills. Famous worldwide as the home of bungee jumping, Queenstown also dishes up jet boating, rafting, zip-lining, parachuting, and paragliding opportunities galore (as well as hot air ballooning, trekking, fishing, climbing, and more). During winter, the town's attention turns to skiing and snowboarding, and Queenstown becomes the base resort for two of the country's best ski destinations - The Remarkables and Coronet Peak. Whenever you visit, this little town, full of lively entertainment and dining options and surrounded by astonishing mountain vistas, packs plenty of thrills. Queenstown lies on the shores of this distinctively Z-shape lake that is hemmed in by high hills and covers an area of 293 square kilometers. According to local Maori legend, Lake Wakatipu came into being when the monster Matau was burnt to death, and his heart is said to still beat at the bottom of the lake, causing the lake water to rise and fall by 10 centimeters every 20 minutes (this is actually due to a tide caused by the lake's odd shape). Europeans first reached the lake in 1853, and during the Otago gold rush of the 1860s, around 30 passenger ships plied the waters here servicing the thousands of gold prospectors in the district. Today, the lake traffic is much more subdued, used by recreational boating, fishing, and kayak tours. One lovely old relic of the gold rush days is still in use: The TSS Earnslaw -- an old 1912 paddle steamer - is now in service as a cruise ship on the lake, and a scenic cruise on board this historic ship is a definite must-do during a stay in Queenstown. One of the most scenic journeys you can take in the Queenstown area is the drive through Skipper's Canyon. This 22-kilometer-long canyon now leads to Coronet Peak but was once home to thousands of prospectors after gold was discovered in the Shotover River (which winds through the gorge) in 1892. Today, the winding and narrow road through the canyon, bordered by breathtakingly vertical drops on one side and high cliffs on the other, makes an incredibly beautiful trip, and traversing the high suspension bridge known as Skipper's Bridge (built in 1901) is a major highlight along the way. Although private cars are allowed along the road, self-drivers should be aware that rental companies will not give out insurance for traveling this route and so it is much easier - and more sensible - to take one of the many Skipper's Canyon tours. The 75-kilometer Shotover River first found fame during the Otago gold rush. But today, it's more well-known as home to one of Queenstown's most popular tourist attractions: the Shotover Jet, which is the only company allowed to operate amid the narrow canyon section of the waterway. The racing journey down the narrow river, hemmed in by dramatic canyon cliffs, is often described as "the world's most exciting jet boat ride" and is one of Queenstown's longest running adventure activities, having been in operation since 1965. The ski resort sitting on the north facing slopes of the mountain range known as The Remarkables is one of New Zealand's best loved winter-fun destinations. Excellent for learners as well as experienced skiers, The Remarkables boasts excellent, ultra-modern ski facilities that have made it extremely popular with European skiers during the Northern Hemisphere's summer. The ski season usually lasts from June to September, and frequent shuttle bus services run to the slopes from Queenstown (there is no accommodation on the ski slopes themselves) throughout the season. The countryside surrounding Queenstown is full of magnificent mountain views, but you don't have to travel out of town to take in some scenic panoramas. The Skyline Gondola, right in town, offers incredible vistas over Queenstown, Lake Wakatipu, and the jagged peaks of The Remarkables beyond, as it journeys up to the 446-meter-high summit of Bob's Peak. The cable car is known for being the steepest in the Southern Hemisphere, and at the top, a number of lookout platforms and an excellent restaurant offer more of those views to soak up. Queenstown's other major winter ski destination is Coronet Peak, which like The Remarkables, offers world-class facilities for skiers. This ski resort really comes into its own though for more experienced ski enthusiasts, offering a variety of excellent trails plus the opportunity to night ski. With the resort's First Tracks pass, early birds have the chance to ski in the morning before the chair lifts are officially open and the crowds arrive. (Both night skiing and First Tracks need to be booked in advance.) During the ski season, which runs approximately from June to September, regular shuttle bus services run between the resort and Queenstown. If you were only going to do one bungee jump in your life, Queenstown would be the best place to do it. AJ Hackett Bungy are the company that first started this worldwide adrenaline craze, and their Kawarau Bridge bungee is the original location where it all began in 1988. The 43-meter jump is on a platform on the historic suspension bridge itself, which was first built over the Kawarau Gorge with the Kawarau River below in 1880. For further thrills, you can also bungee jump from their Nevis Point location, which at 134 meters above the Nevis River, is the highest bungee in New Zealand. Lake Wanaka is a gorgeous sweep of blue, set amid tussock-covered hills and overlooked by the dramatic craggy peaks of Mount Aspiring National Park. 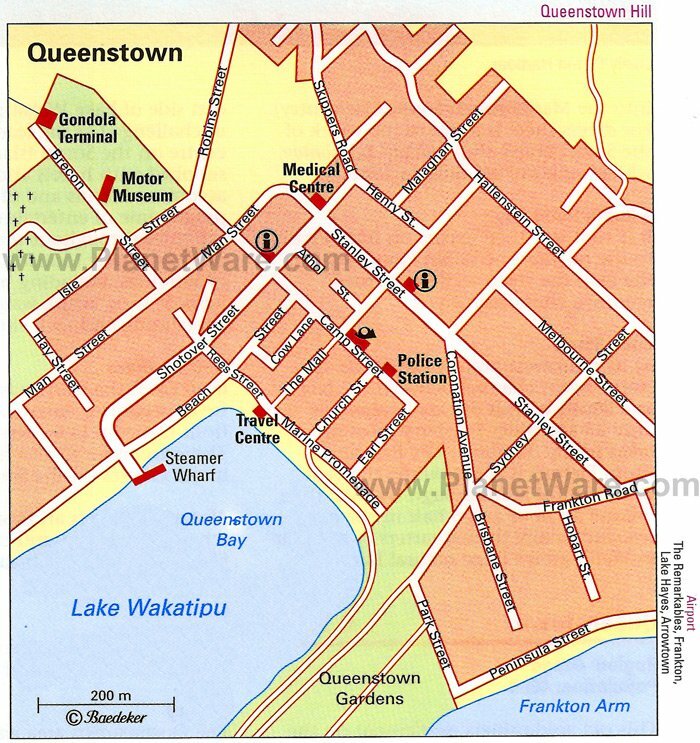 The little town of Wanaka, set beside the shore, is a quieter alternative to Queenstown and is home to many artists (who show their work in a range of galleries in town) and local retirees, who come here for the peaceful atmosphere and lovely natural setting. Fishing, recreational boating, and swimming are the main activities for travelers, although with Mount Aspiring National Park on the doorstep and numerous day walk trails in the area, Wanaka is a major base for trekkers and hikers too. This large botanic garden area sits right on the shore of Lake Wakatipu and is a great place to stroll and admire the lake views. The gardens were first laid out in 1867 and now contain a vast array of both native and international plant species, including a large sweep of Douglas fir trees, which provide shady retreats on a scorching hot Otago summer day. It's most famous for its historic oak and fir trees, which were planted by Queenstown's first mayor in 1866. There is also a lovely rose garden here and a restored band rotunda dating from 1891. This two-to-four-hour easy walk is a great way to experience a slice of the Queenstown region's scenery if you're pushed for time. The track traverses Mount Crichton Scenic Reserve (the trailhead is 10 kilometers out of Queenstown), through tall beech forests, up to Twelve Mile Creek Gorge, which was a major spot for prospectors during the Otago gold rush. Some of the ramshackle miner's cottages are still in place, so you can get a good idea of the harsh lifestyles of the intrepid prospectors. There are excellent views out to the mountain ranges beyond, and Lake Wakatipu below, from parts of the trail. New Zealand's flightless kiwi bird may be a national icon, but it's difficult to see due to its nocturnal nature and remote native forest habitat. Queenstown's Kiwi Birdlife Park allows a rare opportunity to view this much loved creature in specially designed nocturnal kiwi houses. There is also a chance to see tuataras (New Zealand's endemic reptile) up close. If you're traveling with little ones, this park offers some great activities, including daily animal conservation talks and kiwi feeding encounters, plus there's a five-acre forest where plenty of other native birdlife can be spotted. With all the bungee jumping, boating, trekking, skiing, and jet-boating, you wouldn't think there was any more Queenstown could offer for adventure seekers. But Queenstown's Ziptrek zip-lines offer an alternative adrenaline-fueled sightseeing option in town. The zip-lines (called "flying foxes" in New Zealand) network includes the steepest tree-to-tree zip-line in the world and plummets for one kilometer down the hill. Zip-line tours start from the top of Bob's Peak and offer superb panoramic views over Queenstown and Lake Wakatipu. This uphill hike is rather demanding, but all the sweat is worth it for the views down to Lake Wakatipu from Ben Lomond summit. The entire trek to the top, and return, takes a full day (six to eight hours) with the path heading up first through native beech and Douglas fir forests and then alpine tussock land. Be aware that the last portion of the trail before the summit is extremely steep, so a good level of fitness is required. The Ben Lomond Track is easily reached from central Queenstown, with trailheads from both near the top of the gondola terminal and from the access road below. The fantastic Queenstown Trail is a 110-kilometer walking and cycling path that traverses the dramatic countryside surrounding Queenstown. Only fully operational since 2012, this incredible project has opened up vast swaths of private land for cyclists and hikers, creating a route of well-maintained paths that lead you across dizzying suspension bridges, trail across the shores of both Lake Wakatipu and Lake Hayes, and lead out to the historic old gold mining settlement of Arrowtown, as well as the vine-draped Gibbston Valley. The trail contains eight separate tracks, so you can choose a short route or if you've got four or so days up your sleeve, you could cycle or walk the entire trail. Accommodation is available at various points along the way.